If there’s one thing that I’ll say for us Scandinavian stock is that we like our carbs. Since my aunt and uncle moved to Chicago earlier this year (and since my cousin moved here a few years ago), there have been even more excuses for carb and butter consumption in my life. My uncle Paul’s lefse is a non-negotiable, no matter how many pounds of Christmas chub I’m currently locked in a battle to the death with. As Paul says, “lefse is really a butter delivery system”. He’s a good man, my uncle Paul. Oh, and you should know that we Scandinavians like to increase our butter and carb consumption by at least 33% around Christmas. I think it’s in our laws somewhere. So this meant that Sunday was reserved for a good 3 hours of lefse making (there were stations for each of us. I’m not even kidding) and aquavit drinking. I don’t have a picture of all of that. Really, the world doesn’t need to see it. Just imagine lots of little cordial glasses around a kitchen almost completely covered in flour and Scandinavians. Of course, once we were done rolling, cooking, buttering, sugaring, eating and sipping, we needed to move onto some real food. You might not know this, but my dad is a master of the open faced sandwich. Open faced sandwiches are a big deal in Scandinavia. 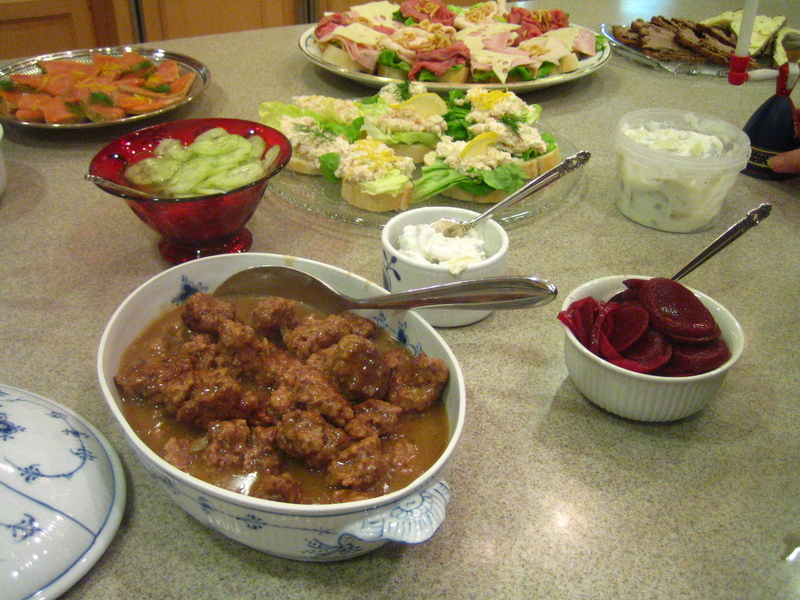 You’re probably familiar with the Americanized “smorgasbord”. 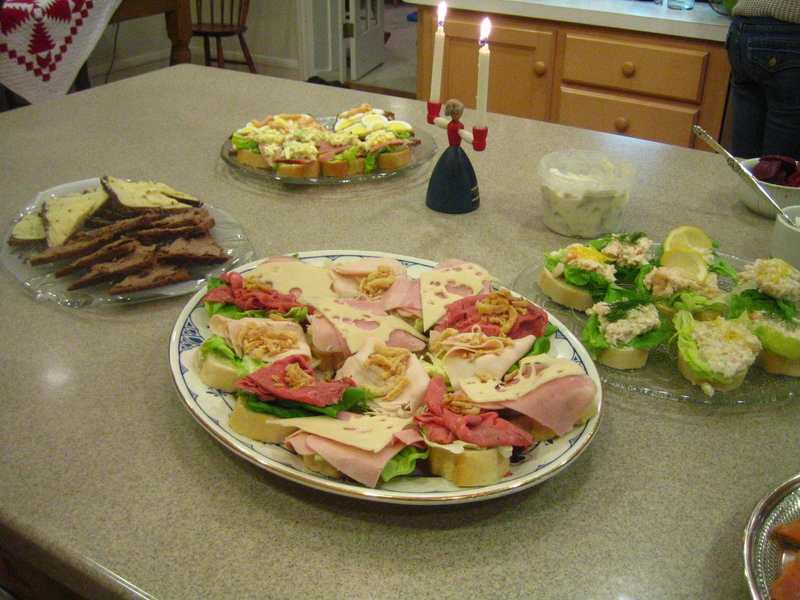 Actually, In Danish the word for these open faced sandwiches is “smørrebrød”. The more you know (cue: shooting star). Anyway, my dad puts together quite the spread. 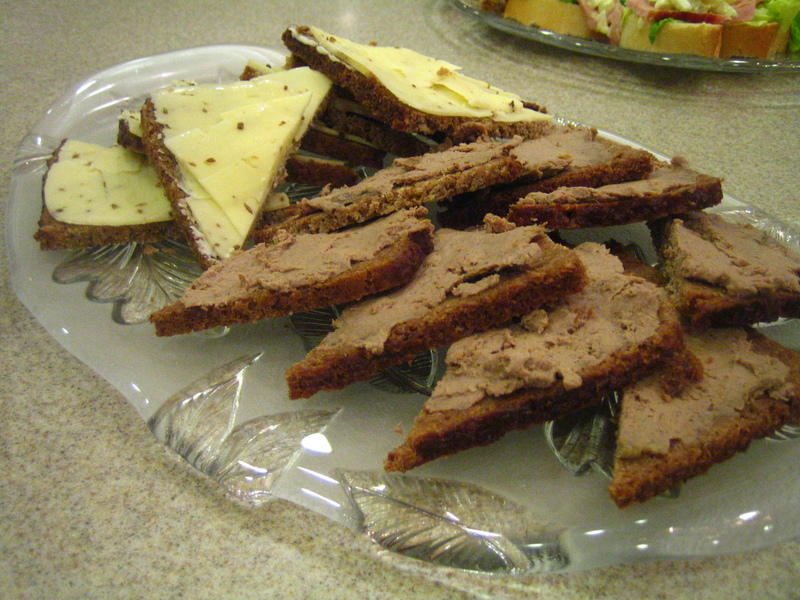 Leverpostej (Scandinavian paté) and nokkeløst sandwiches. It was a nice little feast. And everyone knows that it’s important to properly refuel after consuming lots of carbs and butter. I think I’m ready for Christmas now. Yes. You have to come live here, though. It’s alright, my parents have a nice little space with your name on it in the attic! That is all awesome. I wish my family had more food traditions. That all looks awesome. I could literally eat every meatball in that crock! Quite the spread! Can I be Scandinavian by proxy? I mean, I think I already might be a little Scandinavian anyway – carbs and butter are like my two favorite things in the world. That sounds like SO much fun! A heritage foodie day! Sign me up. That looks amazing. My family doesnt have any fun traditions like that. Unless of course you call staying at home and drinking a tradition. I mean, we are Irish and all . . .
My grandmother used to make lefse. She passed the recipe on to my uncle. I had totally forgotten about it, but I think I deserve a copy! Oh my gosh, I’m drooling! Everything looks so amazing and tasty! !